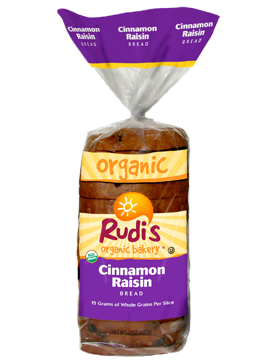 Smart Allergy Friendly Education: Rudi's Dairy-free, soy-free, egg-free, nut-free Cinnamon Raisin Bread - DELICIOUS! Rudi's Dairy-free, soy-free, egg-free, nut-free Cinnamon Raisin Bread - DELICIOUS! I enjoy Rudi's gluten-free products but am absolutely thrilled to have found they now also offer dairy-free, soy-free, egg-free, nut-free, kosher breads too! Even better is that fact that it contains 'NO HIGH-FRUCTOSE CORN SYRUP'. Rudi's Organic Bakery Cinnamon Raisin Bread, produced and distributed by Rudi's Organic Bakery, Boulder, CO.
Rudi's Organic Cinnamon Raisin Review from S.A.F.E. 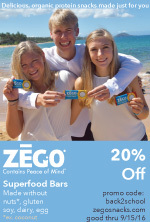 Ingredients include: ORGANIC WHEAT FLOUR, WATER, ORGANIC RAISINS, ORGANIC WHOLE WHEAT FLOUR, ORGANIC EVAPORATED CANE JUICE, ORGANIC SUNFLOWER SEEDS, ORGANIC HIGH OLEIC SUNFLOWER/SAFFLOWER OIL, ORGANIC MOLASSES, ORGANIC WHEAT GLUTEN, YEAST, SEA SALT, ORGANIC CINNAMON, ORGANIC OAT FLOUR, ORGANIC VINEGAR, CULTURED ORGANIC WHEAT STARCH, ASCORBIC ACID, NATURAL ENZYMES. It also states on the packaging: Baked in a facility that also uses tree nuts. I know that there may be some concern about the 'facility using tree nuts' but I will be following up with some wonderful feedback I've already received from Rudi's about their manufacturing practices that will be sure to put some minds at ease. I also bought a loaf of the gluten-free bread and had a 'TOAST OFF' for fun and comparison sake. As a family who doesn't have to navigate gluten allergies, we could taste very little difference between the two. The gluten-free bread is a bit stiffer than the wheat bread but still has a nice taste. The only negative about the gluten-free bread for my household is that it contains EGG and my youngest can't eat it because of allergies. I am thrilled to have more choices from Rudi's with their organic bakery! We'll be back for more!! 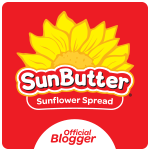 Be sure to let me know if you discover an allergy~friendly product you'd like me to blog about!